The area of present-day Tanzania has been inhabited since pre-historic times, first by hunter-gatherers, and since at least 2000 years ago by farmers. Travellers and traders from the Persian Gulf and India began visiting coastal areas in the early 1st millennium AD, and Arab trading posts were set up long before the 14th century. Portugal took control of some coastal areas and parts of Zanzibar from the 15th century, before Omani Arabs claimed Zanzibar in the mid 19th century, which subsequently played an important role in Arab-controlled slave and spice trades. The mainland part of Tanzania was part of German East Africa from 1884, while Britain took control of Zanzibar. After World War I, the part of German East Africa that became Tanzania (then called Tanganyika) was claimed by Britain. Tanganyika became independent in 1961, and Zanzibar in 1963, and they merged in 1964 to become Tanzania. After independence, the country embraced the ideology of African socialism, with a single party state, transitioning to a multiparty political system in 1992. The first president, Julius Nyerere’s, policy of emphasising national unity and discouraging ethnic divisions helped provide relative political stability. Demands for Zanzibar’s independence from the rest of Tanzania have become stronger in the 21st century. Tanzania’s economy is heavily based on agriculture, which accounts for a quarter of GDP and 85% of exports, including sugar, cotton, cashews, coffee and sisal. Gold mining provides valuable export income, along with some petrochemicals. Tourism is a growth industry, boosted by visits to Mount Kilimanjaro, Zanzibar and wildlife destinations. Strict laws protect wildlife, but poachers pose a constant threat. Tanzania has relatively abundant water resources, with relatively high, but seasonal, rainfall and a number of major rivers and lakes. Most rural areas rely on groundwater from communal boreholes for water supply, and many piped urban supplies depend on groundwater. The post-independence policy of collective villagisation, intended to make the provision of infrastructure more efficient, included the rural water supply programme that aimed to supply free and safe water within 400m of every household within 20 years. However, in the 2000s access to improved water supplies has declined, especially in urban areas. Please cite this page as: Sangea, Upton, Ó Dochartaigh and Bellwood-Howard, 2018. Tanzania. Map developed from USGS GTOPOPO30; GADM global administrative areas; and UN Revision of World Urbanization Prospects. For more information on the map development and datasets see the geography resource page. Tanzania lies in the area between the Great Lakes (Victoria, Tanganyika and Malawi) and the Indian Ocean. The lakes mark the trace of the western branch of the East African Rift System. The coastal area of Tanzania comprises a low-lying flat plain. The centre of the country is dominated by a plateau, which varies in height between 900 and 1800 m above sea level. In the north and south of the country are highland areas, with the highest mountain in Africa, Mount Kilimanjaro (5895 metres above sea level), situated in the northern Pare Range. Tanzania also includes several islands, located off the east coast in the Indian Ocean. The largest of these are Pemba (north), Zanzibar (centre), and Mafia (south). The central plateau region of Tanzania is classified as a hot arid steppe climate, while the northern and southern regions are predominantly tropical savannah. The highland areas in the northeast and southwest of the country have temperate climates with dry winters and warm or hot summers. 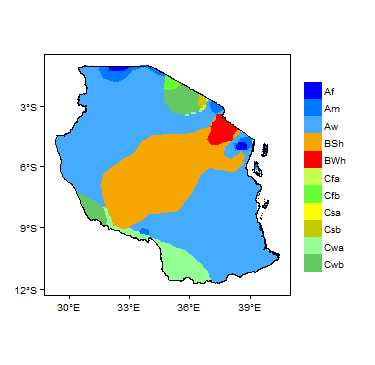 These climate regions are reflected in the spatial variations in observed average annual temperature and precipitation across Tanzania. There are temporal variations in precipitation and temperature across Tanzania. Temperature is generally lower during the winter months of June to August, and highest during November and December. Precipitation is consistently low from June to September, and is higher and more variable during the summer months. More information on average rainfall and temperature for each climate zone can be found on the Tanzania Climate Page. The main surface water features in Tanzania are Lake Victoria in the north, Lake Tanganyika in the west, and Lake Malawi in the south. The main river draining the plateau region into Lake Tanganyika is the Gombe River. Several smaller lakes, including Lake Manyara, Lake Eyasi and Lake Rukwa, also receive discharge from rivers draining the central plateau. The main rivers flowing from the plateau region into the Indian Ocean are the Pangani (north), Wami (centre) and Rufiji (south). The Ministry of Water, through its nine Lake/River Basins, is responsible for river flow gauging. River flow data are stored in each of the Lake/River Basin offices, and also stored centrally at the Ministry of Water. Tanzania National Parks (TANAPA) have river gauging stations at selected areas of interest within National Parks. Tanzania Electric Supply Company (TANESCO) also monitor lake levels and river flow in selected locations. Major surface water features of Tanzania. Map developed from World Wildlife Fund HydroSHEDS; Digital Chart of the World drainage; and FAO Inland Water Bodies. For more information on the map development and datasets see the surface water resource page. The soils of Tanzania are very varied, reflecting the complex interaction of climate, topography and geology. Volcanic activity associated with the East African Rift System typically gives rise to Andosols, while erosion of weathered basic volcanic rocks typically produces Vertisols. Widespread Cambisols reflect continuous uplift of the area surrounding the East African Rift System. These are young soils that generally lack distinct horizons and show limited evidence of soil forming processes. Acidic Acrisols and clay-rich Luvisols represent soil development in areas with significant relief. Extensive Lixosols in the south of Tanzania reflect the predominance of grassland savannah. Fluvisols are widespread in central Tanzania along the floodplain of the Rufiji River and its tributaries. 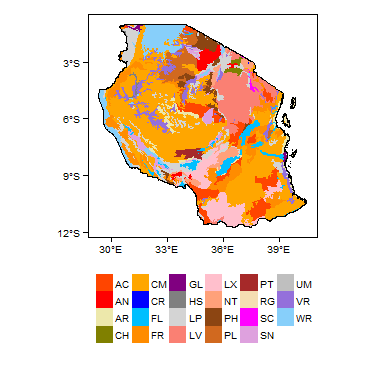 Soil Map of Tanzania, from the European Commission Joint Research Centre: European Soil Portal. For more information on the map see the soil resource page. 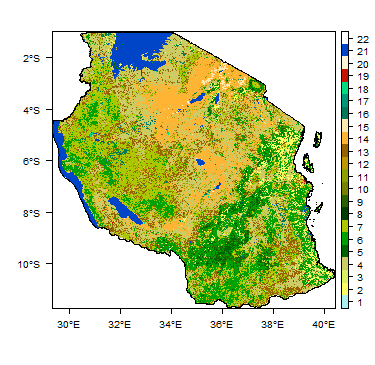 Land Cover Map of Tanzania, from the European Space Agency GlobCover 2.3, 2009. For more information on the map see the land cover resource page. This section provides a summary of the geology of Tanzania. More detail can be found in the references listed at the bottom of this page. Many of these references can be accessed through the Africa Groundwater Literature Archive. The geology map on this page shows a simplified overview of the geology of Tanzania at a national scale (see the Geology resource page for more details). Other geological maps at various scales are produced by the Geological Survey of Tanzania, which hosts a Geological and Mineral Information System that shows paper geological maps available for sale, and also provides a digital geology map at a scale of 1:2 million, which is downloadable in shapefile format. Geology of Tanzania at 1:5 million scale. Based on map described by Persits et al. 2002/Furon and Lombard 1964. For more information on the map development and datasets see the geology resource page. Neogene-Quaternary Unconsolidated sediments cover large parts of the country, including alluvial sediments in valleys, coastal/marine sediments along the coast, and continental and lacustrine sediments. Cretaceous-Quaternary Carbonatite volcanoes began erupting in the Cretaceous and continued into the Cenozoic. Ol Doinyo Lengai is the world's only active volcano with carbonatite lava. Alkaline volcanic rocks of Neogene age are common north of Lake Nyasa and Lake Natron. Volcanism is associated with the East African Rift system. Diamondiferous kimberlites are concentrated within the Precambrian Tanzania Craton (see below), mainly south of Lake Victoria, with outliers in the Precambrian (Proterozoic) Mobile/Orogenic Belt (see below). The main kimberlite provinces are Shinyanga-Mwadui, Mabuki, Speke Gulf, Lake Eyasi and Iramba Plateau. Cretaceous Sedimentary Late Jurassic to Tertiary Late Jurassic to Tertiary sedimentary rocks in Tanzania are associated with a long-lasting marine regression, which led to the deposition of mainly continental and deltaic sedimentary rocks, interbedded with thin marine beds. The The continental units include sandstone, siltstone and mudstone. The marine units contain coral limestone, silty shale and mudstone, and are mostly found in southern Tanzania, with isolated outcrops in the central-east and northeast. The sedimentary rocks were deposited in rift troughs of the East Africa Rift, trending SW-NE, and also in the coastal basin. In the coastal basin there are two major structural trends associated with faulting: the NNE-SSW Tanga Fault and the NNW-SSE Lind Fault. Karoo Supergroup Carboniferous to Lower Jurassic The Karoo system consists mainly of sandstone, siltstone and shale, with more minor coals, conglomerates, tillite, mudstones and limestones. In southwest Tanzania the Karoo sedimentary rocks are of continental origin; in the northeast they are predominantly marine. The major basins of the Karoo System trend NNE. The smaller basins are aligned in a NW direction between Lake Nyasa and Lake Tanganyika. The sedimentary sequence of the Karroo System reaches 7000 m thick. Granitic Rocks and Pegmatites Archean - Proterozoic Intrusive igneous rocks are not distinguished on the geology map on this page, but they occur intruded into Archaean and Proterozoic rocks across Tanzania. Granitic rocks are subdivided into syn-, post-, and late-orogenic. Late-orogenic granites typically form the cores of gneiss domes, or occur in complex intrusions. Various types exist: granites that are typically intruded into Archaean and Proterozoic rocks, micro-granites, and granodiorites. Different types of pegmatite occur in syn-orogenic granites, migmatites, and metamorphic rocks of the Archean and Proterozoic terrains. Pegmatites are abundant in the Proterozoic Usagaran and Ubendian Systems; they are rare in the Archean Dodoman System; almost absent in the Archean Nyanzian System; and do not occur in rocks younger than Proterozoic age. Granites within the Archean and Proterozoic rocks of Tanzania are scarce, small and discordant with the general structural trend. Micro-granites typically occur as lenticular masses within syn-orogenic granites in the Lake Victoria Goldfield. Granodiorites occur in several places including the Archean Lake Victoria Goldfield and Proterozoic Lupa Goldfield. Proterozoic The Bukoban System comprises largely unmetamorphosed sedimentary rocks of anorogenic and continental origin, amygdaloidal basalts, and andesites. They have occasionally been subjected to local cataclasis. The sedimentary rocks of the Bukoban System include sandstones, siltstone, shales, red beds, chert, conglomerates, quartzites, greywackes, and dolomitic limestones. The rocks of the Mozambique Belt are intensely metamorphosed and deformed, and include granitoids, granulite, meta-anorthosites, gneisses, amphibolites, marbles, pegmatites, mafic and ultramafic rocks, migmatites, quartzites and schists. The Ubendian System includes granulite, amphibolite, migmatite, gneiss, schist, quartzite and marble. Intrusive rocks are predominantly granite, but also include gabbronorites, eclogites, metamorphosed amphibolites, dolerites, peridotites and carbonatites. The Usagaran System comprises sedimentary and volcanic rocks of the Konse Group and gneisses, amphibolites and lenses of granulites of the Isimani Suite. The Karagwe-Ankolean System comprises argillaceous formations that have been slightly metamorphosed to argillites, phyllites and schists. Arenaceous formations have also been metamorphosed to quartzite. In the Lower and Middle Proterozoi, rocks of the Usagaran System were largely deposited in geosynclinals troughs. The Konse Group of the Usagaran System trends NE-SW and is bordered by the Tanzania Craton to the West and Isimani Suite to the East. The Isimani Suite is highly metamorphosed and is unconformably overlain by the Konse Group. Tanzania Craton: Dodoman and Nyanzian-Kavirondian systems, Greenstone Belts Archean The craton is a composite of several different terrains of variously metamorphosed Archaean rocks. The Dodoman System, in central Tanzania, is the oldest and is of amphibolites facies. It is intruded by ultramafic, mafic, and felsic rocks (granites and pegmatites discussed above). The Nyanzian and Kavirondian Systems are in northern Tanzania, and include gneiss, schist, quartzite, migmatite, amphibolite and granulite. The Greenstone Belts to the south and east of Lake Victoria are regionally metamorphosed to greenschist facies, and locally metamorphosed to epidote and amphibolites facies near granitic intrusions. The Greenstone Belts include ultramafic rocks, gabbros, dolerites, granites, syenites, diorite and lamprophyries. The Greenstone Belts are also intruded by mafic to felsic intrusions of various ages. This section provides a summary of the hydrogeology of the main aquifers in Tanzania. More information is available in the references listed at the bottom of this page. Many of these references can be accessed through the Africa Groundwater Literature Archive. The hydrogeology map on this page shows a simplified overview of the type and productivity of the main aquifers in Tanzania, at 1:5,000,000 scale (see the Hydrogeology map resource page for more details). Tanzania is also covered by the SADC hydrogeological map and atlas (2010), available through the SADC Groundwater Information Portal. Alluvial deposits are mainly seen in coastal delta regions and along river valleys. The coastal plain consists of largely unconsolidated sediments (beach sands, dunes and salt marsh), with some consolidated limestone deposits. Alluvium is found in river valleys. There are also volcano-pyroclastic sediments close to formerly active volcanoes. Borehole yields vary depending on lithology, but the greatest potential lies within the volcano-pyroclastic and alluvium deposits of the Kahe Basin and Sanya Plain near Kilimanjaro. Yields typically vary between 0.2 and 2 l/s. The thickness of unconsolidated aquifers is usually not well defined, but the water table depth tends to vary between 10 and 20 m. Boreholes are often drilled to depths of 100-200 m.
There are no major groundwater quantity issues. Groundwater quality is generally good, with the exception of the coastal plain deposits, which are vulnerable to saline intrusion. Rainfall is the dominant source of recharge, but infiltration also occurs from rivers and lakes. Coastal Sedimentary Aquifer The groundwater potential of the Coastal Sedimentary Aquifer varies depending on its lithology, with higher productivity provided by the sandstones and limestones. Marls and shales are generally unproductive. The aquifer is also generally unconfined. Borehole yields in the Coastal Sedimentary Aquifer are highest in the limestone (1-6 l/s) and slightly lower in the sandstone (up to 2.5 l/s). The aquifer generally varies in thickness from 5-30m. The water table typically sits at a depth of 10-35 m. Boreholes are not normally drilled below a depth of 80 m.
The productivity of the Coastal Aquifer is limited due to issues with saline intrusion. Salinity and nitrate are common groundwater quality issues. Karoo Sandstone Aquifer Sandstones and conglomerates of the Karoo System are characterised by intergranular flow and storage, which can be locally enhanced by secondary fracture permeability. The aquifer is generally unconfined. Boreholes commonly provide yields of 0.1 to 5 l/s, but yields up to 15 l/s have also been reported. The aquifer generally varies in thickness from 5 - 30m. The water table typically sits at a depth of 10 - 35 m. Boreholes are not normally drilled below a depth of 80 m.
Basement Complex Groundwater occurrence in Basement Complex rocks is largely limited to secondary permeability, such as weathered zones, joints, fractures, faults or solution features. The potential of weathered zones depends on the degree and depth of weathering and associated fracturing, and the saturated thickness. The aquifers are generally discontinuous, and often confined. Higher yields are encountered in narrow bands of gneisses and metasediments, in which permeability can be enhanced by a greater degree of fracturing due to their proximity to fault zones. 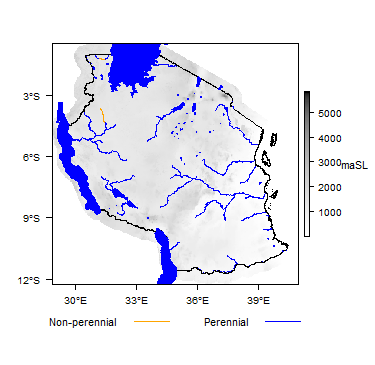 Such zones occur in the Pangani Basin. Higher yields are also obtained where thick weathered zones are associated with bedrock fracturing, such as in the Makutapora Basin in Dodoma, and in fractured quartzite and metasediments in otherwise dense gneisses. Borehole yields in the basement complex rocks are generally around 3 l/s and vary with lithology. 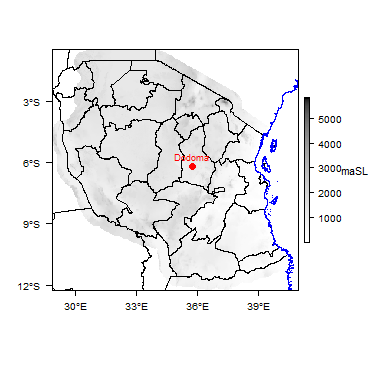 A maximum yield of 13 l/s is recorded in the Pangani Basin. Transmissivity in the Pangani Basin ranges significantly. Hydraulic conductivities of between 1 and >16 m/day have been reported. Studies in the weathered fractured aquifer of the Makutupora Basin have indicated a transmissivity of 670 m²/day in the basement rocks, while overlying sand and gravel deposits have a transmissivity of around 490 m²/day. The basement aquifers are typically up to 50 m thick. Boreholes are typically drilled to depths of 70-120 m in the Dodoma System and 40-250 m in the Usagaran System. There are no major groundwater quantity issues. There are no major groundwater quality issues. Recharge generally occurs through fracture zones, faults or lineaments. In Tanzania there is inadequate data and information available for the major aquifers. Data that exists are often scattered, fragmented and incomplete. There is a lack of groundwater resources management to deal with issues of overexploitation. There is inadequate public awareness of potential sources of pollution and their impact on the groundwater environment. There is inadequate government control of the private drilling sector. High chloride concentration (salinity) is a problem in the coastal regions of Lindi and Mtwara, and in central regions such as Singida and Shinyanga where there is a high evaporation rate and poor drainage. 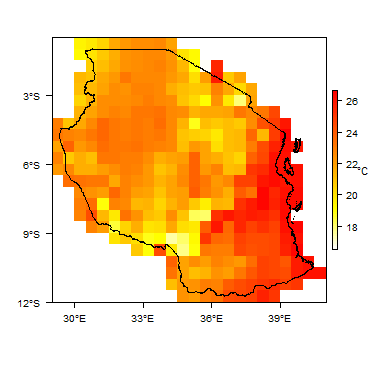 In Lindi and Mtwara regions, high levels of carbon dioxide have been reported in groundwater (Kongola et al. 1999), which causes issues with corrosion. High fluoride concentrations are a common problem in the areas surrounding the Rift valley system (e.g. Kilimanjaro, Arusha, Singida and parts of Shinyanga regions) (Mato et al. 2002). 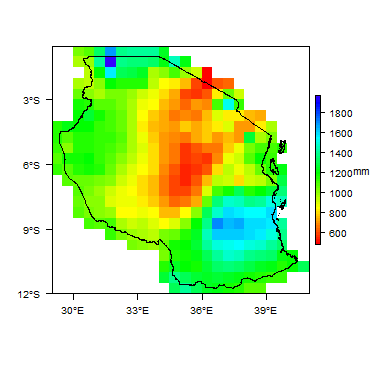 High iron content in groundwater has been observed in Mtwara and Kagera regions (Kongola et al. 1999). Nitrate levels of more than 100 mg/l were reported in the Makutupora basin, Dodoma and Singida town (Nkotagu, 1996; Kongola et al. 1999). There are several groundwater dependent ecosystems in Tanzania that are dependent on the Makutopora aquifer in the Dodoma Region. The Little Kinyasungwe River and the Hombolo lake/wetland are discharge points for this aquifer and are important sources of water for domestic supply, livestock and irrigation in the Chamwimo District. Groundwater is a vital source for both rural and urban water supply schemes in Tanzania. Towns such as Dar es Salaam, Singida, Babati, Arusha, Moshi and Dodoma depend largely on groundwater for public water supply. Many rural water schemes are also built on groundwater sources. Most sources consist of boreholes with electric or hand pumps. Groundwater use in industry is more concentrated in urban areas, particularly in Dar es Salaam, where around 80% of Tanzania's industrial activity takes place. The Water Resources Management Act, No. 11 of 2009, which regulates water resources management. The Water Supply and Sanitation Act, No. 12 of 2009, which regulates water supply delivery. These pieces of legislation are based on the 2002 National Water Policy. The Water Resource Management Act outlines the institutional and legal framework for the sustainable management and development of water resources, outlines principles for water resources management, provides for the prevention and control of water pollution, and provides for the participation of stakeholders and the general public in the implementation of the National Water Policy. Drilling licences (issued to all drillers, allowing them to operate a drilling rig). Part IV of the Water Resource Management Act outlines the different institutions which are to be responsible for the development and management of water resources, including groundwater. Institutions mentioned in the Act are: The Directorate of Water Resources (DWR), the National Water Board (NWB), Basin Water Boards (BWB), Catchment and Sub-catchment Water Committees and Water Users Associations (WUAs). The Act also specifies the duties and responsibilities of these institutions. There are currently no significant issues concerning the management of these aquifers. The Ministry of Water has established groundwater monitoring stations in four basins: Pangani, Wami/Ruvu, IDB and Rufiji. Groundwater level monitoring is carried out in the Makutapora Basin in the Dodoma region, where ten automatic water level recorders are installed. Groundwater level monitoring is also performed in observation wells in Arusha by the Arusha Urban Water Supply Authority and in TPC-Moshi. Most of these measurements are taken manually on a daily basis. Total Coliform, Faecal coliform, and E coli. Bacteriological monitoring is performed in Makutapora only. Many of the references below, and others relating to the hydrogeology of Tanzania, can be seen in the Africa Groundwater Literature Archive. Carl Bro, Cowi Consult, Kampax-Kruger. 1982. Regional Water Master Plans for Iringa, Ruvuma and Mbeya Regions, Hydrogeology Vol 9. Ministry of Water for Tanzania. Mjemah IC. 2007. Hydrogeological and Hydrogeochemical Investigation of a Coastal Aquifer in Dar-es-Salaam, Tanzania. Laboratory for Applied Geology and Hydrogeology, Geological Institute, Ghent University. Mjemah IC, Van Camp MC and Walraevens K. Groundwater exploitation and recharge rate estimation of a quaternary sand aquifer in Dar-es-Salaam area, Tanzania. SADC. 2010. Hydrogeological Map of Tanzania. Shindo S. 1989. The study on the Recharge Mechanism and Development of Groundwater in the Inland Area of Tanzania. Progress report of the Japan-Tanzania joint Research 4. Chiba University, Chiba, Japan. This page was last modified on 6 March 2019, at 10:46.